Celebrate your day among friends with high spirits! Be the super hero at your party, and fly! Party room is available after your flight and you can watch your video playback on our large TV. Ask our reservation specialist for details. You may also bring your own cake or dessert. All other refreshments or food can be purchased at our onsite Oasis Cafe! Click here to see our Menu for options. If you have any special food requests just give us a call to discuss them. Celebrate your day among friends with Island time fun! Hang ten at your party, and surf! Party room is available after your surf session with paper tablecloth and balloons. Searching for a FANTASTIC place to have your action packed event? Look no further, SkyVenture New Hampshire and Surf’s Up is the perfect solution with excitement, adrenaline & adventure! 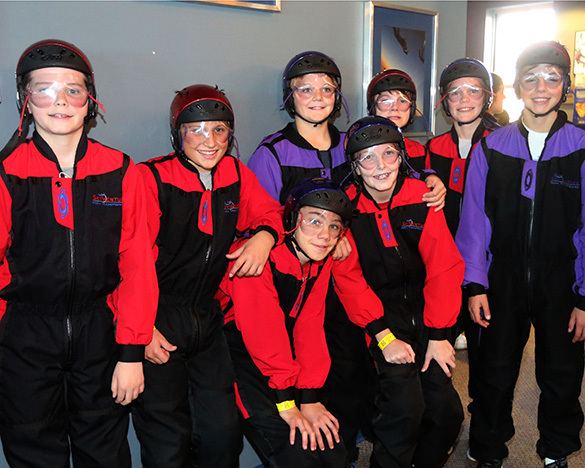 You and your group will enjoy the sensation of skydiving without needing a parachute, a plane, or any previous skydiving experience! We can fly groups of 12 every 30 minutes and have an observation deck where your group can view their friends flying. The SkyVenture New Hampshire experience is so similar to real skydiving that professional skydivers use the wind tunnel for training. 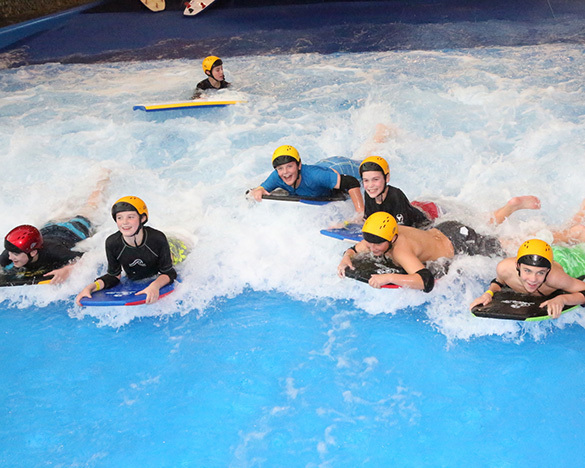 We can Surf up to 15 people every 30 minutes and have surf side seating out in our tropical Island setting. Our surf machine is the first in North America and the largest in the world. Also located surfside is our Rock climbing wall, fishpipe water ride and The Oasis Café. We have multiple party rooms, our surfside seating area and a casual conference room available for use depending on your groups needs. We will be happy to create a custom package to meet your desires. Our Oasis Café can provide all your catering needs & video/photo packages can be arranged as well. All of our rooms are equipped with large LED TV’s for use for computer presentations or playback of event video’s. We can also work with you to arrange any other special needs that you may have.